Would you like to make some extra money? Can you spot errors in books and texts? If so, then you should definitely consider proofreading. Proofreading is a skill that’s in demand. Content is being created at a fast pace, and people expect quality. Any entrepreneur, business owner, or writer will tell you that proofreading is invaluable for helping them create valuable content that’ll lead to sales. In this post, you’ll learn how to make extra money proofreading. Also, don’t forget to sign up for the free training masterclass! Many people think you need an English degree, certification, or membership in an association to work as a proofreader, but the truth is you don’t. You do, however, need proper training. Proofreading is considered to be the easiest form of editing, and it’s the last chance to review text for mistakes. Proofreaders ensure that a message is clear and consistent. Can you imagine making money from reading? It’s not a pipe dream—I know because I do it every day. You don’t need physical prowess or specialized equipment. Also, every industry creates content. Whether it’s a trade, academics, or health and wellness, the required proofreading skills are the same. It’s important for you to understand the industry and what clients expect. That’s why I offer FREE online masterclasses to educate you on certain aspects of proofreading and copyediting. Your ability to spot little details like an extra space or missing punctuation will make your job as a proofreader much easier. Anyone can spot the obvious errors, but you have to be able to spot not-so-obvious ones, as well. Freelance proofreading is a solo job, and you have to be able to manage your time and projects without any supervision. Once a deadline is set and the work is sent, you’re left alone. Part of a proofreader’s job is being able to problem solve and research issues on your own. There are rules and guidelines of the English language that you need to know, but you don’t always have to follow them. Remember that language evolves, and you have to be accepting of a client’s voice. Everyone’s writing style is different, and it’s important to preserve a client’s style even if you disagree with the content. You need to have an excellent command of the English language. This means you can recognize obvious grammatical errors, and know the basics of spelling and punctuation. For example, you can recognize when a writer has used both past tense and present tense in the same sentence. There are numerous sites to find freelance proofreading jobs. Some are job posting sites and others are job bid sites. Of course, it’s also a good idea to get your own site up and running. If you have a higher-level academic background like a masters or PhD, then you can also approach editing agencies, who match proofreaders with clients for work. You can work as a general proofreader or you can choose to focus on a specific niche or niches. Many proofreaders leave themselves open to working with all kinds of content while also targeting a niche that they have above average knowledge in. You can also make more money this way depending on what field you focus on. For example, if you work for an ad agency, then you can proofread copy for advertising and marketing agencies. 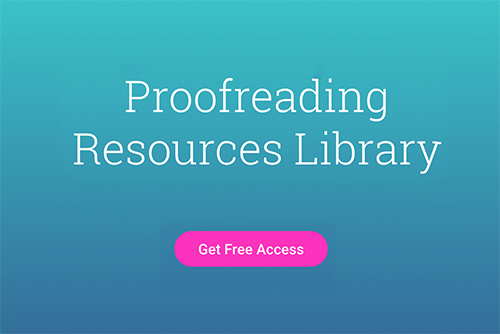 Gain some experience so you feel comfortable proofreading text and to discover your workflow. “Warm up” your skills by doing some volunteer proofreading for a friend, family member, or associate. This will be valuable experience for you to include in your resume. You’re more likely to be considered for a job if you have some professional experience behind you. Working with text is only part of being a freelance proofreader. You need to hustle and find work! Get on social media and market yourself for free through platforms like Twitter and LinkedIn. Get creative in your job search. Think of who writes content and approach people. What I love about proofreading is that it’s a lifelong skill. You’ll never forget how to do it, and it’s a skill that you can do from anywhere, anytime. I like to say that proofreading is a long game. Landing a client or project won’t happen overnight, but if you’re patient and persistent, it will pay off. There will always be content that needs to be corrected and polished. I have often been called a ” walking dictionary” and have spotted soooo many errors in ebooks that it makes me want to become a proofreader so I can correct them. I have also been called a grammar Nazi lol. I would like to get paid for doing this but not sure where to start. I know I could be happy doing this for a living. Thanks for your honesty in this post. I’ve read some proofreading articles that make it seem like anyone can do it and become rich. So not true!! As a proofreader myself, I always tell people they HAVE to be trained before they can start working. From now on, if anyone asks me for tips on how to start, I’ll just send them to your site! Proper training makes a big difference in skill set and confidence!